David Cameron has been elected as the new Conservative leader by a margin of more than two to one over David Davis. The 39-year-old beat Mr Davis by 134,446 votes to 64,398 in a postal ballot of Tory members across the UK. The Old Etonian, an MP for only four years, said the Tories must change and be in tune with today's Britain with a "modern compassionate Conservatism". His defeated rival, Mr Davis, said the leadership contest had been a preamble to a Conservative election victory. 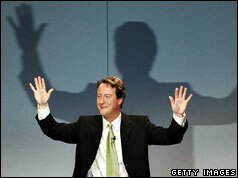 He hailed Mr Cameron as the next Tory prime minister and said the race had made the party look thoughtful and mature. Outgoing leader Michael Howard had said he was standing down after May's general election. David Cameron promotes a "modern, compassionate Conservatism"